A ghoulish night awaits you as Halloween approaches. Make your Halloween Dance the best it can be with our awesome themes and decorations. Begin your preparation with a visit to our Halloween Dance section. Be sure to check out Halloween kits. They come packed with everything you need to create your spooky scene! Every dance needs a slogan! To complete your haunted Halloween dance, choose a romantic, fun, or sinister phrase from the list below – or be daring and create your own! Give students a sneak preview of the fun and let them know that this is a not to be missed Homecoming event by sending out unique invitations. Now is the time to choose theme wording, so you can carry your theme through your decorating and your favors. A few fun suggestions for the Halloween spirit: “You Are Cordially Invited to Attend Your Own Wake!,” “Warning – Attend This Homecoming at Your Own Risk!” If you are sending out traditional paper or imprinted invites, consider sprinkling some 3-D spider confetti inside. Give your Homecoming Dance guests spooky Halloween thrills with the decorating ideas below! • Have the students enter the building through a haunted tunnel using black corrugated paper. With duck tape and a staple gun, form a “tunnel” shape with the paper. • For fun, hang some black streamers from the tops of the tunnel in a couple of spots to give students the creeps. Place spiders on the floor for them to crawl through. 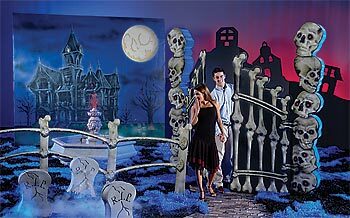 • Hang a few glow-in-the-dark items in the tunnel such as glow eyes to add to the excitement. • Greet students with a very scary Grim Reaper. This will scare the pants off of even the most enthusiastic student! • Cobwebs are one of the most inexpensive, high-impact decorating items you can use to create an authentic atmosphere for your scariest of parties. Hang them throughout your event room – fasten them to the corners of tables, around arches and columns, and across the stage. You can never have too many of these around! • Finally, remember that lighting is everything! You can choose to go with candle lighting only, which is very mysterious but can be a little dangerous. Another option is to use black light bulbs wherever possible to create an atmosphere that is to die for! Place a strobe light in one corner of your room, or in a separate room for a spine-tingling effect! • Start your table off with a covering of black gossamer to keep the atmosphere creepy and dark. Next, add one large carved out pumpkin and two smaller pumpkins in the center of the table. Don’t carve faces on the pumpkins but instead fill them with water. Add our mist maker inside the pumpkins for a spooky mist – all without chemicals! • Place some tissue grass mats around the pumpkins and across the center of the table, letting it hang down from the sides of the table. • By placing one or two faux ravens perched on the pumpkins and grass mats you will add an interesting and eerie appeal to your table. • For place cards, we offer coffin favor boxes that can be personalized with students’ names. At each table setting, place a headstone with a candy pumpkin and a small patch of Cobwebs. • For your plates, if you choose to go simple, check out our Gold 9″ Paper Plates along with our black cutlery. Dress them up a bit by adding our Halloween napkin assortment to the ensemble. Tie the napkins with the silverware up in a bundle and tie with a small bunch of raffia or ribbon. Add a clip-on crawlie to each bundle and scatter a couple of spiders on each plate as well. Give students favors they can use during the party … this will add excitement and fun! • Halloween mugs go great with the napkin assortment and are perfect favors when filled with Halloween candy or goodies. • Serve a chilling witch’s brew to students in personalized glassware imprinted with your theme, or in one of our inexpensive stadium cups. When the dance is over, the can take them home as an extra-special souvenir! • There are several styles of photo favors that can be personalized with your special wording and design. This is a particularly good favor idea if you will have a photo setting at your party to take pictures of the couples enjoying their enchanted evening together. • Personalized napkins that complement your theme are always a hit! We offer a large selection of dinner, luncheon and beverage napkins in an impressive palette of 20 colors. We also offer a wide range of ink colors, as well as a metallic foil, holographic foil, prismatic foil or a traditional ink imprint. • Napkins can be laid out on a buffet table, or can be displayed at each place setting. Place napkins in the center of each place setting at an angle, or unfold them and place them in glasses for a tall dramatic look. The napkins can also be tied (and bundled with plastic cutlery) with a multitude of items to match your theme. Try curling ribbon, gossamer streamers, ric-rac or ribbon. This entry was posted on September 10, 2007 at 9:56 PM	and is filed under Halloween Dance, Halloween Decorations, Halloween Party. Tagged: Halloween Dance, Halloween Decorations, Halloween Party. You can follow any responses to this entry through the RSS 2.0 feed. You can leave a response, or trackback from your own site.